Lerkendal stadium is owned by Rosenborg Ballklub. The local bus company, AtB, offers a number of services to the ground. 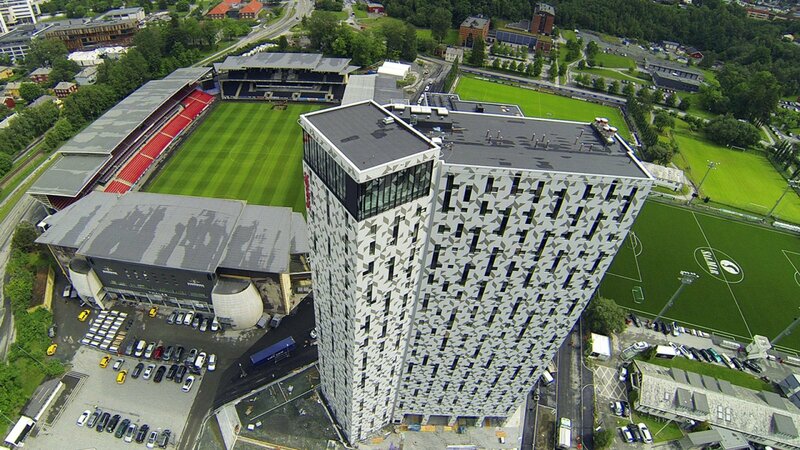 Lerkendal Stadium is located approximately two kilometres south of the city centre. 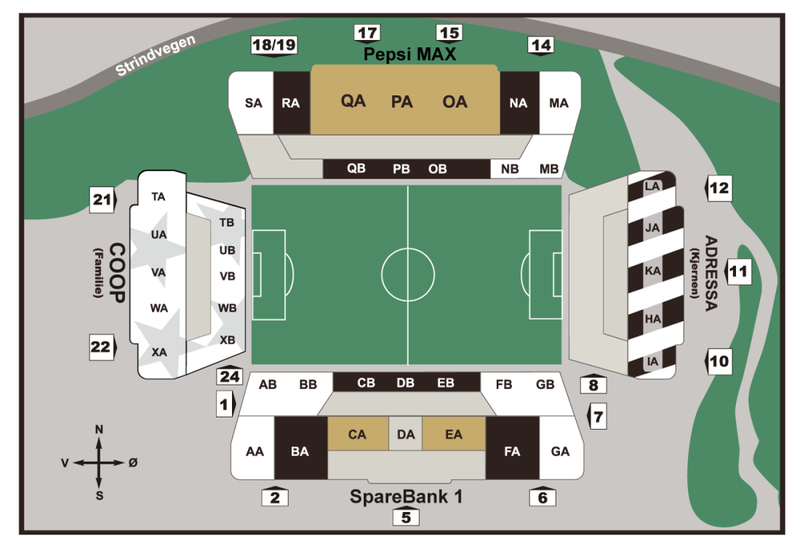 The best alternative is the bus stop Lerkendal stadium (lines 3, 8, 17, 55, 60 or 66). When taking the train, disembark at Lerkendal station. From the airport, some of the airport shuttle coaches stop at the stadium, check with the driver prior to boarding. Alternative options are taxi or rental car. Entry to the Ground is explicitly subject to abiding by Norwegian Laws, RBK´s Ground Regulations and the rules and regulations of FIFA, UEFA, The Norwegian Football Association or Norsk Toppfotball, depending on the relevant competition being held. Entry to the Ground constitutes acceptance of the Ground Regulations. In the interest of safety all spectators must only occupy the seat allocated to them as stated on their match ticket. Unnecessary movement is not allowed. Persons occupying the wrong seat will be evicted. Standing in any of the seating areas whilst play is in progress, is strictly forbidden. The obstructions of gangways, access ways, exits and entrances, stairways and similar places is strictly forbidden. Nobody without permission is allowed to climb any structures within the Ground. All persons seeking entrance to the Ground acknowledge the organizer’s right to undertake frisks and to refuse entry to or evict from the Ground any person refusing to submit to such a search. The organizer can NOT be held responsible for any accident/injury, loss or damages to persons/property in or around the Ground. No guarantees can be given by the organizer that an event will take place at a specific time or on a specific date and the organizer reserves the right to reschedule an event without prior notice and liability whatsoever. There will be NO refund of ticket costs, travel costs etc, if an event is abandoned. Persons influenced by alcohol or any other kind of intoxicants will be evicted from the Ground area. No merchandise (including literature) of any nature may be distributed or offered either free or for sale by any person within the Ground perimeters, without written permission by the organizer. CCTV (television surveillance system) is in function both outside and inside the stadium. Mobile telephones are permitted within the stadium, provided that they are only used for personal and private use. Any individual who has entered any part of the Ground designated for a group of supporters to which they do not belong, may be evicted from the Ground, be it for their own security or any other reason. At all times, whilst present at the Ground, spectators must comply with all instructions made known by the organizer, stewards or police officers. The organizer reserves the right to evict anybody failing to comply with any of the Ground Regulations.